, an eminent Italian poet, was born of a noble family at Florence, in 1475, and passed the early part of his life in habits of friendship with Bernardo and Cosimo Rucellai, Trissino, and other scholars who had devoted themselves more particularly to the study of classical literature. 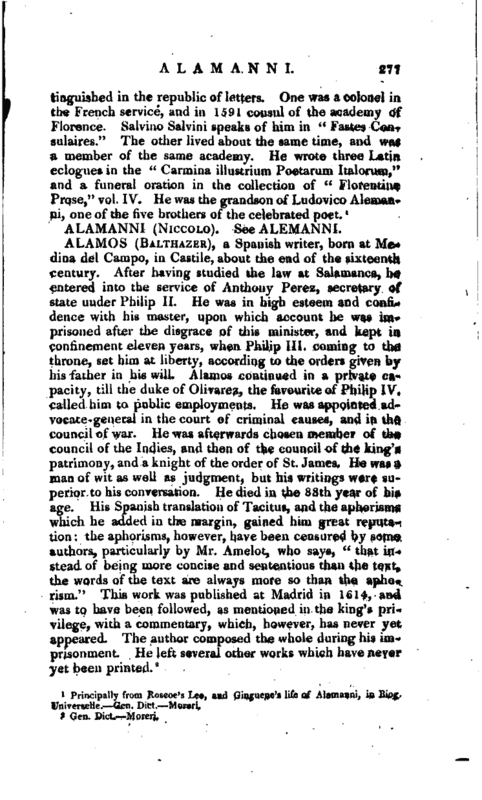 Of the satires and lyric poems of Alamanni, several were produced under the pontificate of LeoX. In the year 1516, he married Alessandra Serristori, a lady of great beauty, by whom he had a numerous offspring. The rank and talents of Alamanni recommended him to the notice and friendship of the cardinal Julio de Medici, who, during the latter part of the pontificate of Leo X. governed on the behalf of that pontiff the city of Florence. 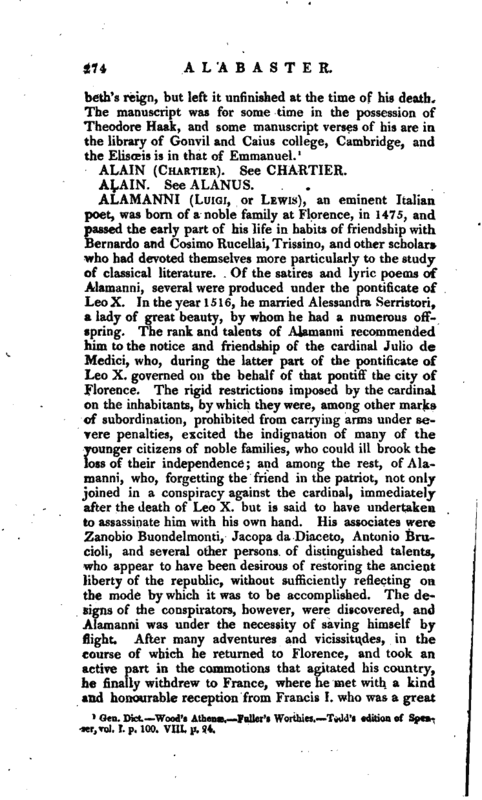 The rigid restrictions imposed by the cardinal on the inhabitants, by which they were, among other marks of subordination, prohibited from carrying arms under severe penalties, excited the indignation of many of the younger citizens of noble families, who could ill brook the loss of their independence; and among the rest, of Alamanni, who, forgetting the friend in the patriot, not only joined in a conspiracy against the cardinal, immediately after the death of Leo X. but is said to have undertaken to assassinate him with his own hand. His associates were Zanobio Buondelmonti, Jacopa da Diaceto, Antonio Brueioli, and several other persons of distinguished talents, who appear to have been desirous of restoring the ancient liberty of the republic, without sufficiently reflecting on the mode by which it was to be accomplished. The designs of the conspirators, however, were discovered, and Alamanni was under the necessity of saving himself by flight. 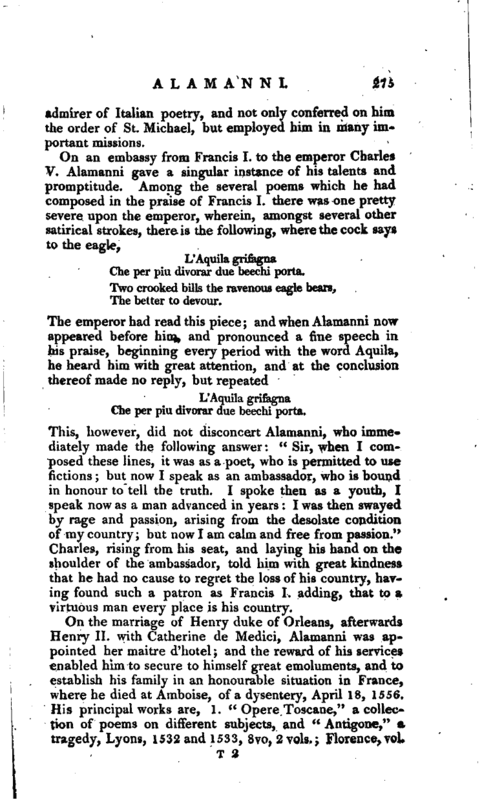 After many adventures and vicissitudes, in the course of which he returned to Florence, and took an active part in the commotions that agitated his country, he finally withdrew to France, where he met with a kind and honourable reception from Francis I. who was a great | admirer of Italian poetry, and not only conferred on him the order of St. Michael, but employed him in many important missions. Che per piu divorar due beechi porta. This, however, did not disconcert Alamanni, who immediately made the following answer: “Sir, when I composed these lines, it was as a poet, who is permitted to use fictions; but now I speak as an ambassador, who is bound in honour to tell the truth. I spoke then as a youth, I speak now as a man advanced in years: I was then swayed by rage and passion, arising from the desolate condition of my country; but now I am calm and free from passion.” Charles, rising from his seat, and laying his hand on the shoulder of the ambassador, told him with great kindness that he had no cause to regret the loss of his country, having found such a patron as Francis I. adding, that to a virtuous man every place is his country. On the marriage of Henry duke of Orleans, afterwards Henry II. with Catherine de Medici, Alamanni was appointed her maitre d’hotel; and the reward of his services enabled him to secure to himself great emoluments, and to establish his family in an honourable situation in France, where he died at Amboise, of a dysentery, April 18, 1556, His principal works are, 1. “Opere Toscane,” a collection of poems on different subjects, and “Antigone,” a tragedy, Lyons, 1532 and 1533, 8vo, 2 vols. ; Florence, vol. | I. 1532; Venice, 2 vols. 1533—1542. Notwithstanding thesa frequent editions, they were prohibited in the pontificate of Clement VII. both at Florence and Rome, in the latter of which places they were publicly burnt. 2. “La Coltiva­?ione,” Paris, 1546, a beautiful edition corrected by the author and dedicated to Francis I. again reprinted the same year at Florence; and frequently reprinted, particularly a correct and fine edition, in large 4to, by Comino, at Padua, 1718, with the Api of Rucellai, and the epigrams of Alamanni; and at Bologne in 1746. 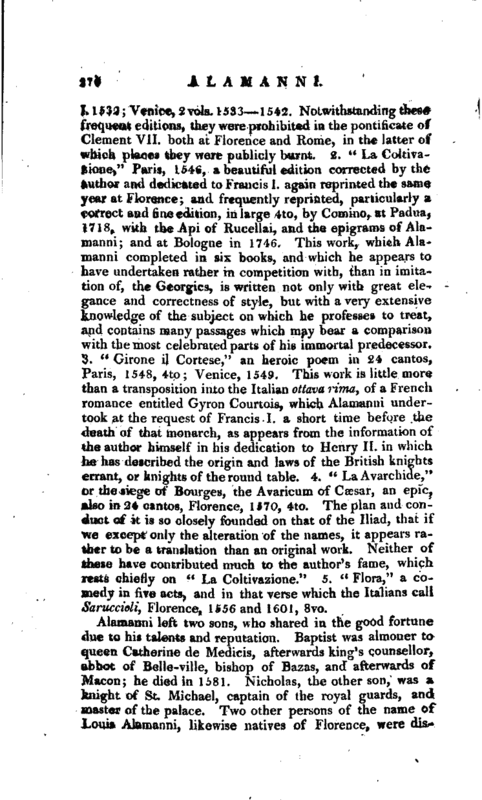 This work, which Alamanni completed in six books, and which he appears to have undertaken rather in competition with, than in imitation of, the Georgics, is written not only with great elegance and correctness of style, but with a very extensive knowledge of the subject on which he professes to treat, and contains many passages which may bear a comparison with the most celebrated parts of his immortal predecessor. 3. “Girone il Cortese,” an heroic poem in 24 cantos, Paris, 1548, 4to; Venice, 1549. This work is little more than a transposition into the Italian ottava rima, of a French romance entitled Gyron Courtois, which Alamanni undertook at the request of Francis I. a short time before the death of that monarch, as appears from the information of the author himself in his dedication to Henry II. in which he has described the origin and laws of the British knights errant, or knights of the round table. 4. “La Avarchide,” or the siege of Bourges, the Avaricum of Caesar, an epic, also in 24 cantos, Florence, 1170, 4to. The plan and conduct of it is so closely founded on that of the Iliad, that if we except only the alteration of the names, it appears rather to be a translation than an original work. Neither of these have contributed much to the author’s fame, which rests chiefly on “La Coltivazione.” 5. “Flora,” a comedy in five acts, and in that verse which the Italians call Saruccioli, Florence, 1556 and 1601, 8vo. Principally from Roscoe’s Leo, and Ginguene’s life of Alamanni, in Biog. Universelle.—Gen. Dict.—Moreri.